All Things Jabu (ATJ): Hi Rassie. Firstly thanks for making some time to have a chat with us! How are the preparations for the games going? Rassie Pieterse (RP): It’s only a pleasure! Preparation has been going really well. We had a very tough conditioning camp last month with Dr Derick Coetzee (ATJ – Check it out in our preview post) and his team in Bloemfontein. It was a tough 10 days both physically and mentally but I am confident to say that this is the fittest the team has ever been. Subsequent to this we went on a very successful European tour where we played 8 test matches in 2 weeks against Belgium (win), Ireland (draw), Wales (win), Scotland (win), India (win 1 lose 1) and Spain (lose). 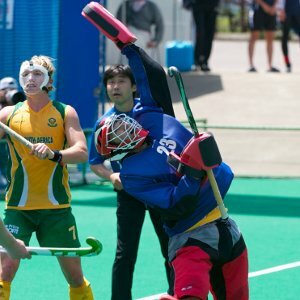 ATJ: For you personally, a lot of the players in the squad play professional hockey in Europe while you are still based in South Africa, do you think you are still being challenged enough staying at home? RP: There is no doubt that the European leagues are much stronger than the SA club leagues at the moment. I managed to play for a short period in the Dutch Hoofdklasse league last season. Every game you are tested by some of the top players in the world, taking you out of your comfort zone on a weekly basis. Being back at home you really have to be disciplined and hard on yourself to ensure that you get quality time both during practices and games. The local SA guys routinely train together in our provinces to make sure that we keep on pushing ourselves to remain sharp! This prepares us for the step up to international matches. ATJ: What is it like having to face Justin Reid-Ross drag flicks in training? RP: Facing “rocket man”!? There is always good banter going on in the short corner practices between the 2 of us. 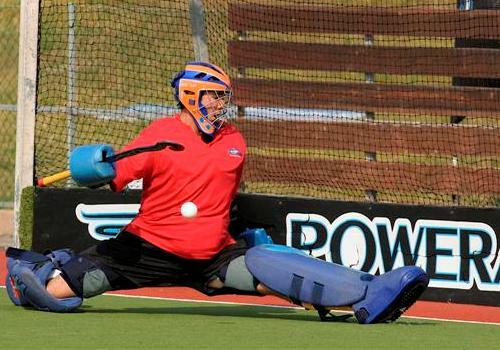 Justin is with a doubt one of the fastest flickers in the international hockey world. I often think that I am glad he is standing on my side of the field!!! ATJ: Speaking of Justin, who is the hardest striker of the ball that you have faced? ATJ: At the Champions Challenge you were the second choice keeper, but you showed it in Japan that you are now firmly the first choice again? Was there a challenge laid down by Gregg for you to play your way back in? RP: The challenge from Clarkie was for me to regain my previous form and perform as he knew I could. I went over to Holland for 2 months and trained really hard amongst top class players. 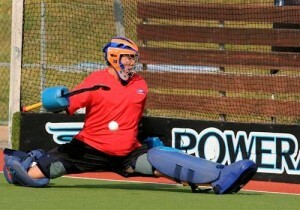 This allowed me to regain my spot as the number one goalkeeper in SA. ATJ: Fantastic stuff, we hope you keep the position for a long time! Having just played your 50th Cap for South Africa, are there any that standout as an especially memorable for you? RP: My debut for my country will always be special and memorable but there is definitely one game that stands out. We played against Germany in 2007 just after they had won the World Cup and beat them! It was amazing to beat the world champions in front of a home crowd at Randburg stadium. ATJ: What impact has Gregg had on the team since he took over? RP: Clarkie has made a massive difference since he took over in 2007. He played more than 250 games for SA so he knows the game inside out, but mostly he understands the players. He runs a very tight ship and there is no room for mediocrity. He pays close attention to small details that make the difference at international level. ATJ: Is there a rivalry in the national team between the guys from the different provinces? RP: Not at all! We spend so much time together; we are almost like a family…. Hence we adopted the name “the lads”. ATJ: Onto more personal matters, your family is completely into hockey, will you be introducing the game to your daughter as soon as she can play? RP: Yes, my wife Lesley is an international umpire. Nina has no choice at the moment as she is growing up next to the hockey pitch. She already owns a few 18” TK hockey sticks, which our basset hound periodically chews on! ATJ: You are also a role model to a lot of young players in South Africa now, what advice would you give them as they aim at making it into the National team one day? RP: Never give up on your dream. I only started playing hockey at the age of 18 and a lot of kids out there think that if you did not make a provincial or a junior national team that you will never make it to the top! This is not true. Keep working hard towards your goal but be ready to sacrifice a lot. ATJ: Thanks Rassie, I’m sure many of the players will agree with that sentiment. What other sports are you a fan of? ATJ: And which teams do you support? RP: The Lions… And anyone playing against the Bulls! ATJ: Rassie thanks so much, we wish you and the LADS all the best of luck for the Olympics and we hope you and the lads bring some extra bling home! RP: Thanks Jabu! We will give it our all! Follow Rassie on twitter and the SA Hockey LADS. 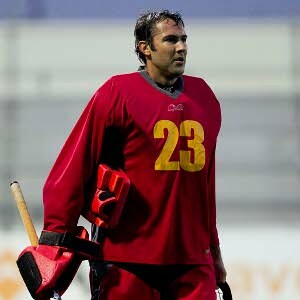 And get into the game by reading our preview of the Men’s Hockey event at the Olympics.